Gosh, another birthday! 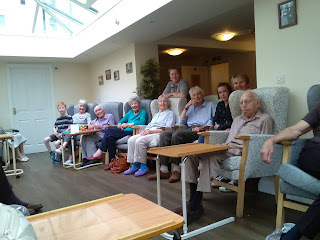 It seems that back in the day 9 months ago there were some very busy parents....! This time it's Patricia's birthday and to celebrate we had the Banjo Man come in and play some tunes on his, yep you guessed it, his guitar! 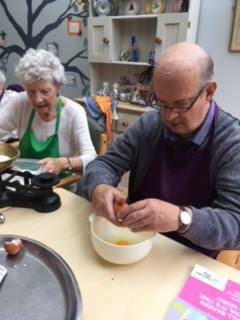 (Only kidding of course) He has graced the Orangery once before to everyones delight and this time was no different, Happy Birthday Patricia! 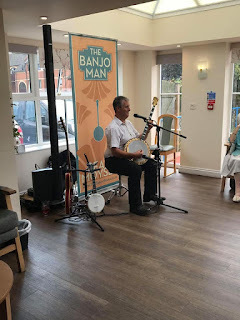 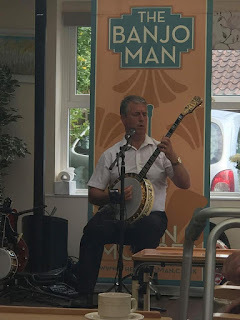 The Banjo Man performs in the Orangery. 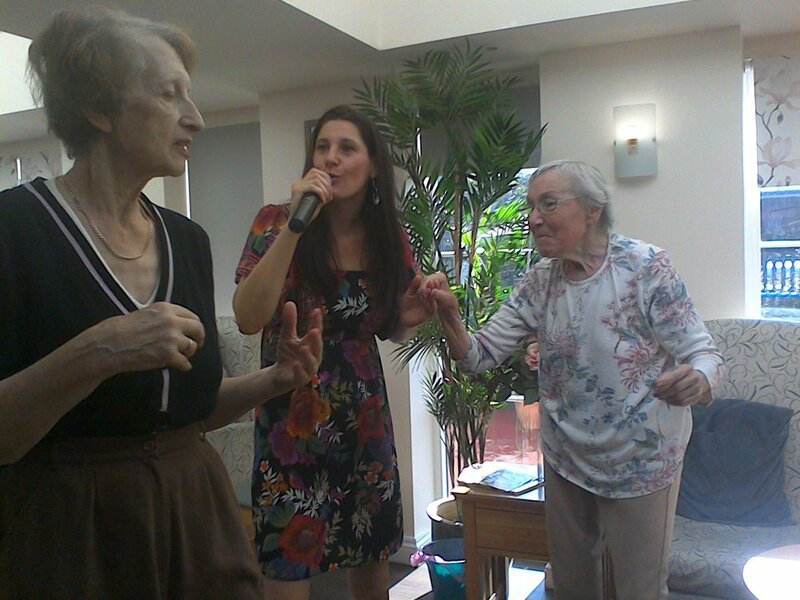 Patricia and her daughter Hayley look on and enjoy the music - Happy Birthday Patricia! 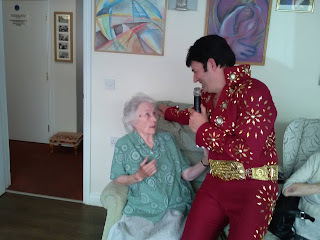 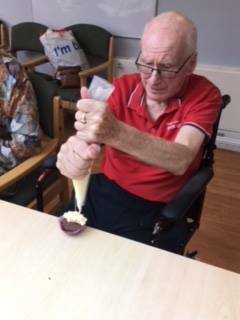 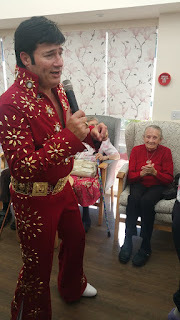 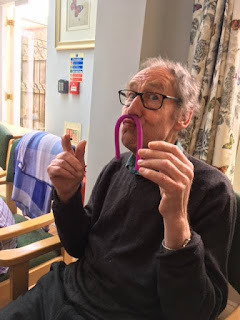 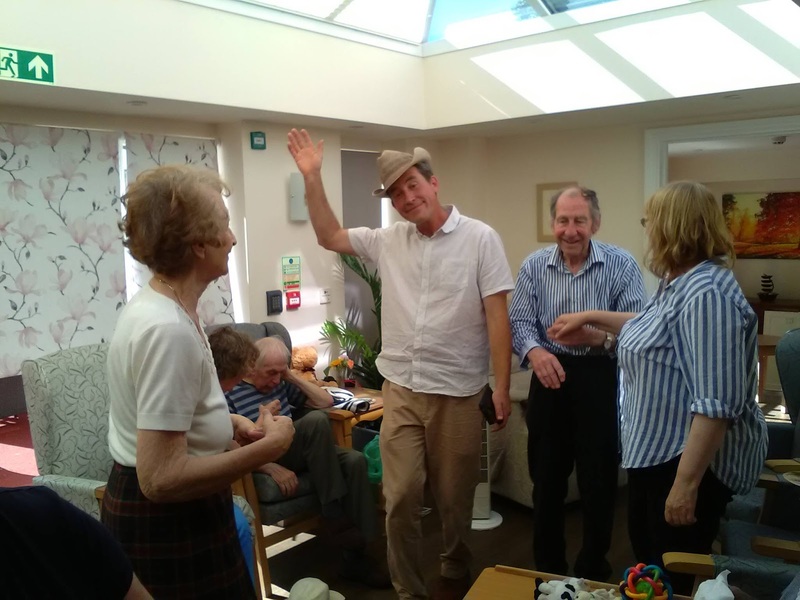 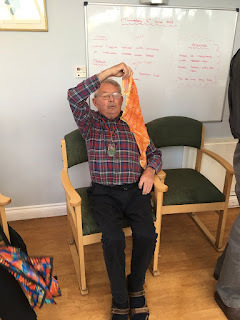 It was Gwyneth's birthday a few weeks back and to celebrate the King himself came in to do a very special performance for everyone at Woodspring House. 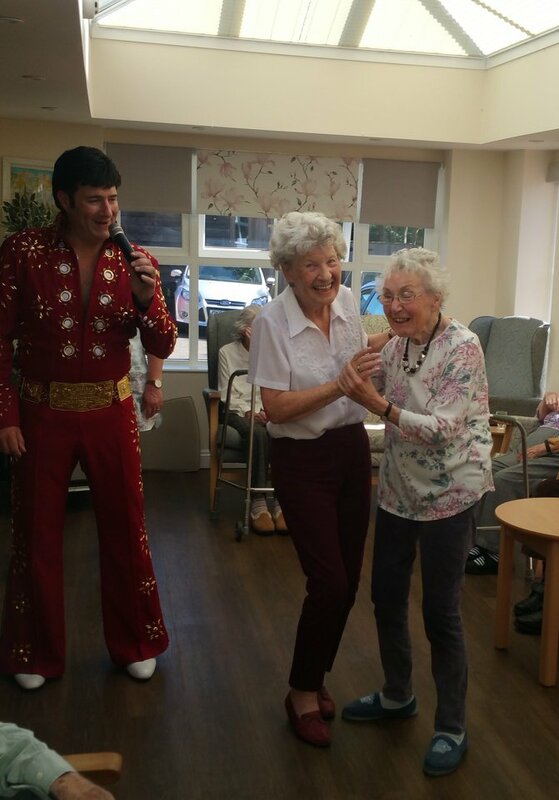 He got everyone'rock 'n' rollin, and just look at those outfits! 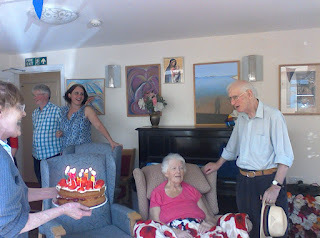 Happy Birthday Gwyneth! 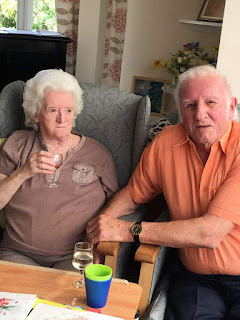 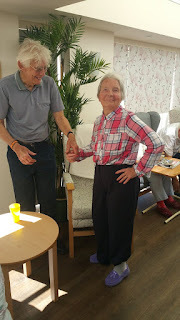 Then on another occasion it was Janet and Magda's birthday and to celebrate we had in Two gentleman of Leisure, a duo act where one guy plays the piano and the other sings - it went down well with the crowd everyone said how good they were. Janet's birthday cake arrives, Happy Birthday!! Joyce looks on as Tim is silly! Elvis gets Pauline and Betty going! 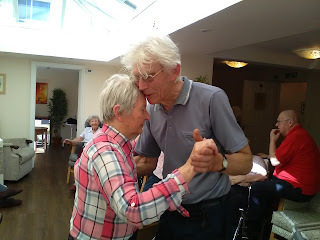 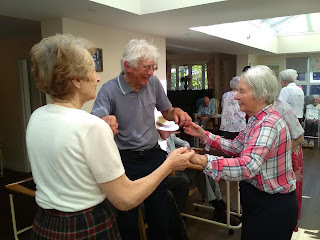 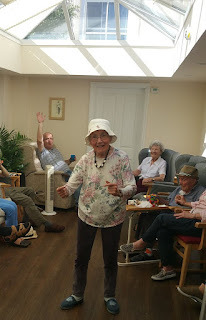 It was a few weeks ago now but we have still been doing Movement to music with Heather each week. We welcome family and friends to join us in our hours of Movement to Music (or as I like to call it Mischief and Merriment), so please come along and join in the fun! 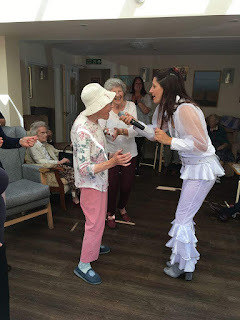 It was also June's birthday the other week and to celebrate we had Jayne Martin come in to entertain us with some Abba numbers. With songs like Dancing Queen and Gimme Gimme Gimme to sing and dance to, there wasn't a moment of rest! 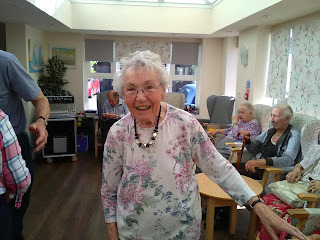 Happy Birthday June! With her husband Mike. Pauline belts out Dancing Queen. 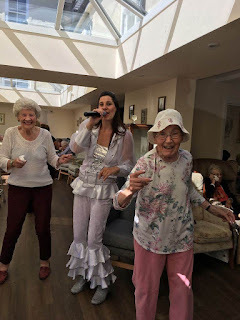 Jayne goes all out to perform as Abba and Pauline and Betty love it! 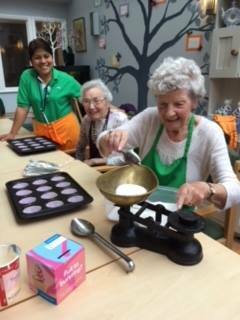 Marjorie and Ena in M & M.
To raise money for Alzheimer's day Victoria organised a cup cake baking day! 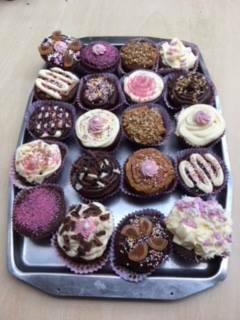 We had so much fun making, baking and decorating the cup cakes and we raised £50 so far! 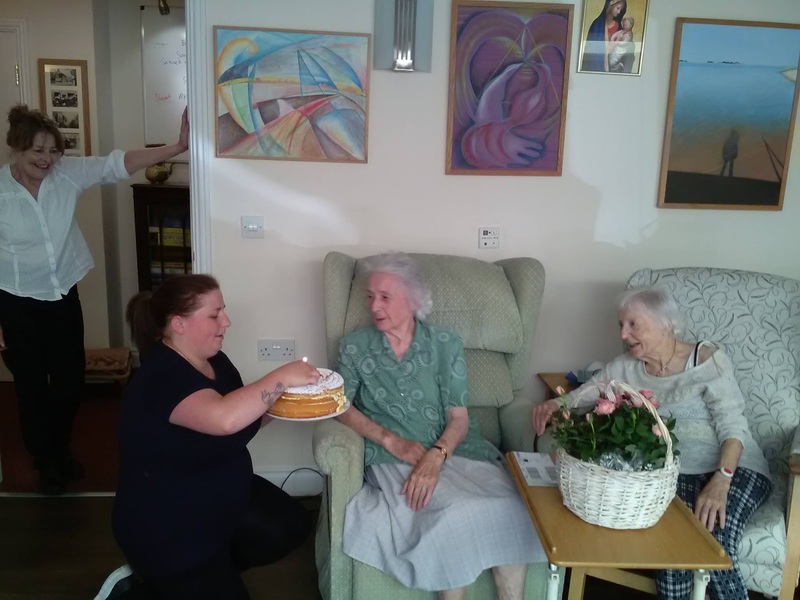 Although the cup cakes were out for sale, one of the biggest challenges Victoria faced was stopping the residents from getting to them first! 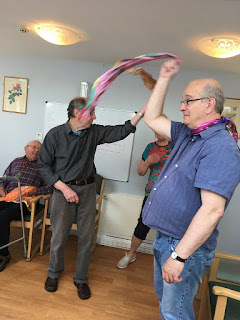 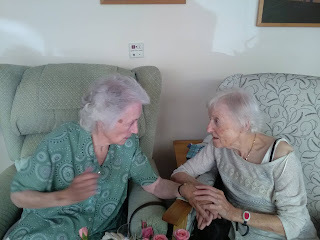 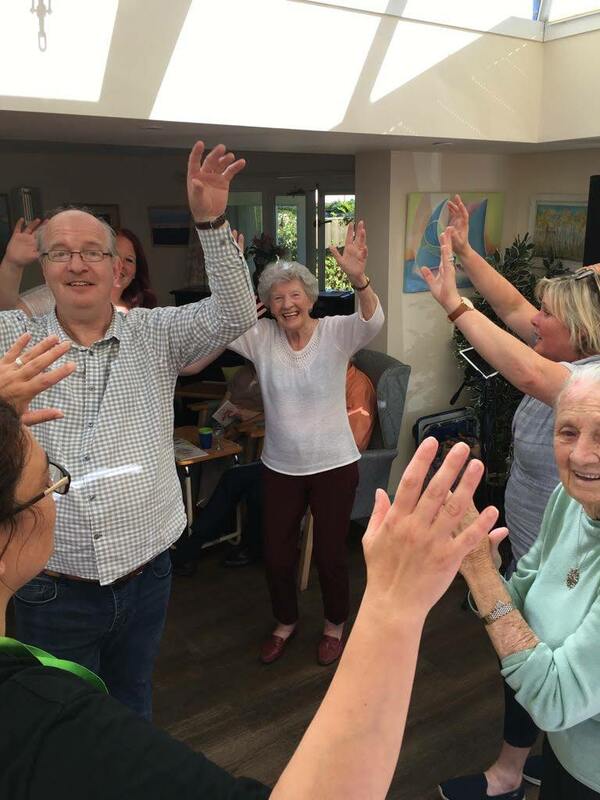 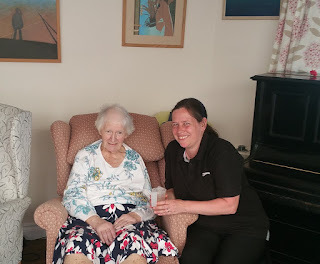 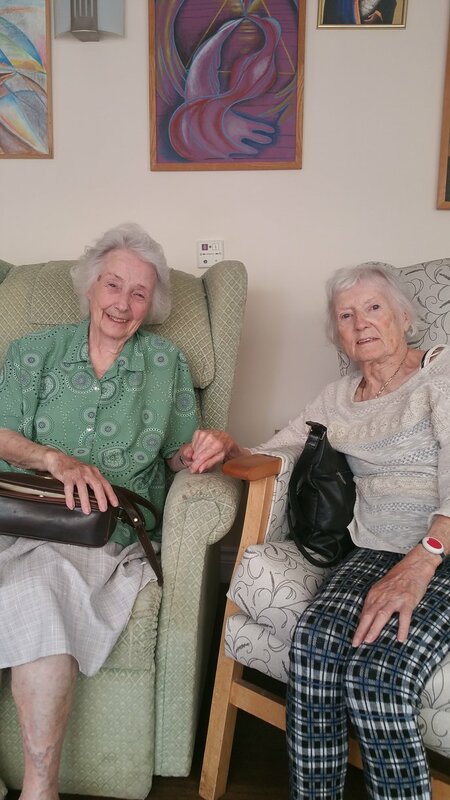 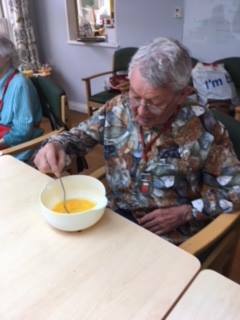 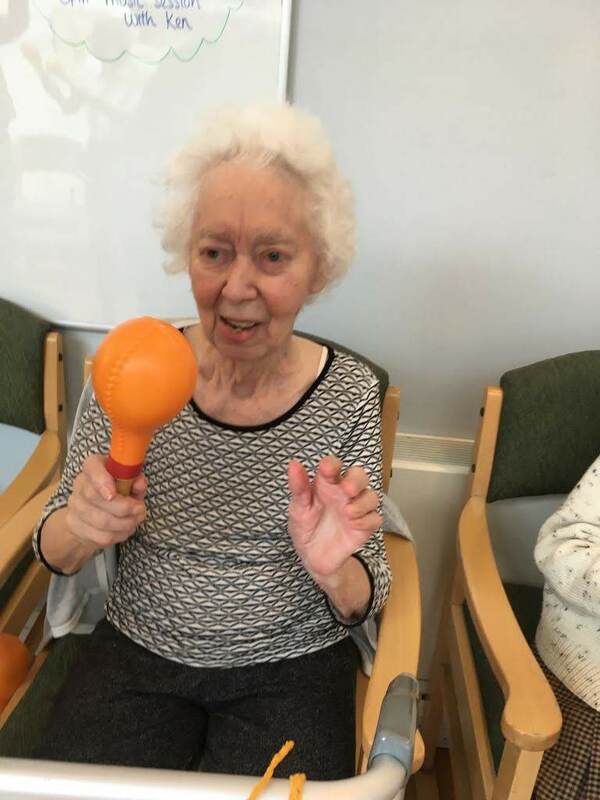 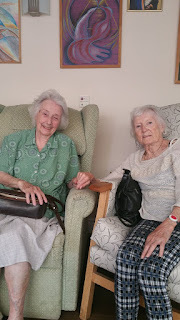 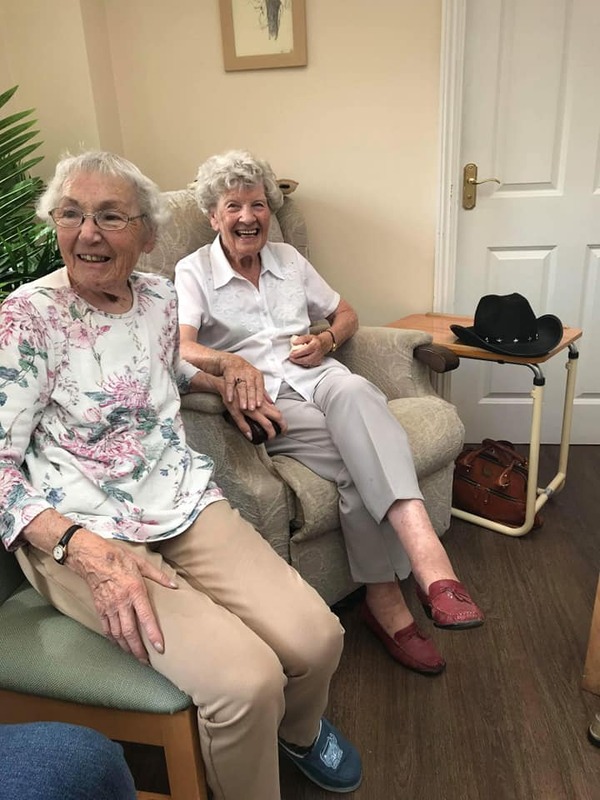 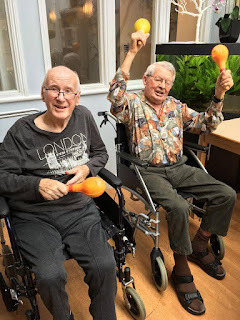 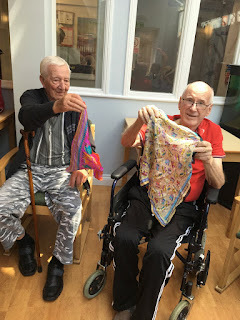 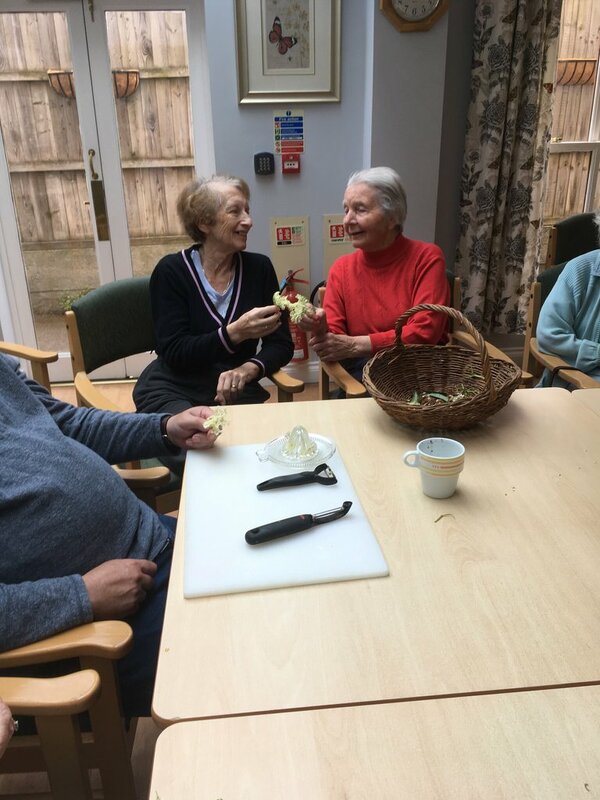 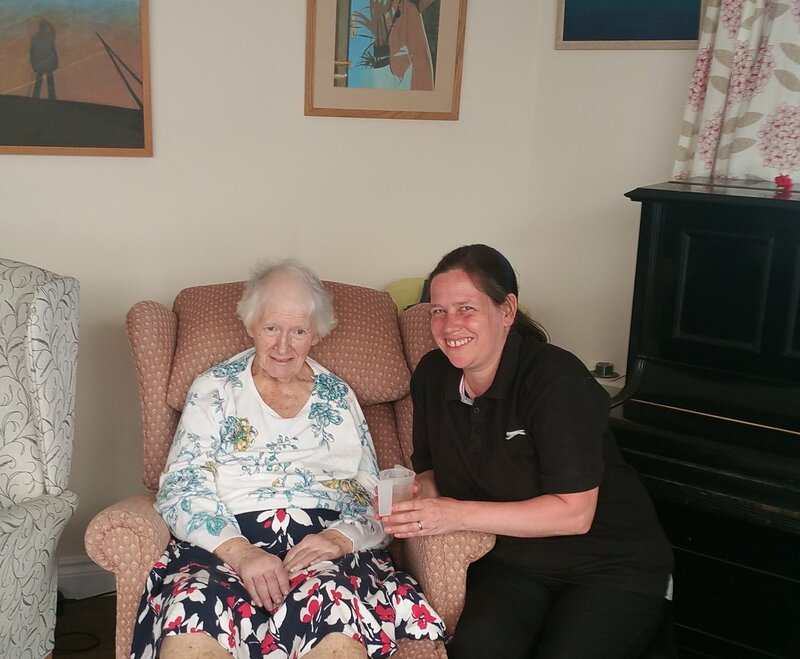 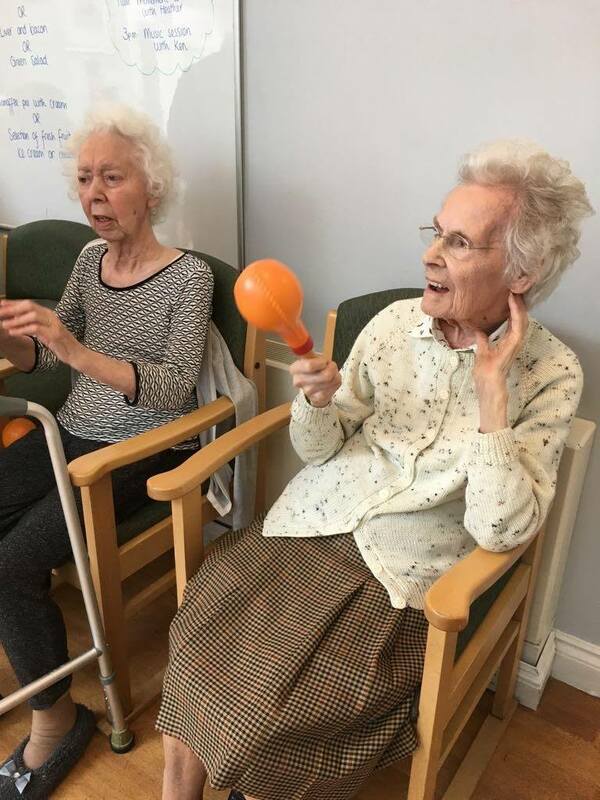 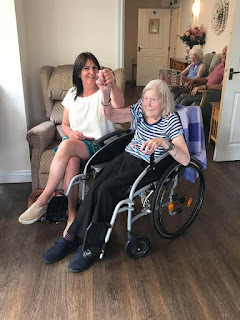 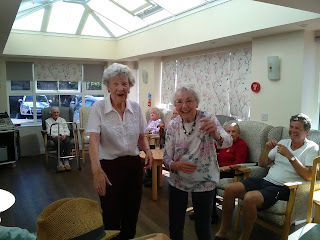 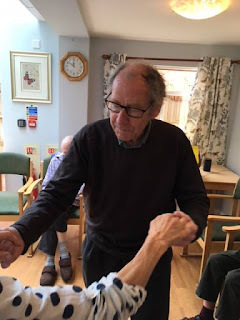 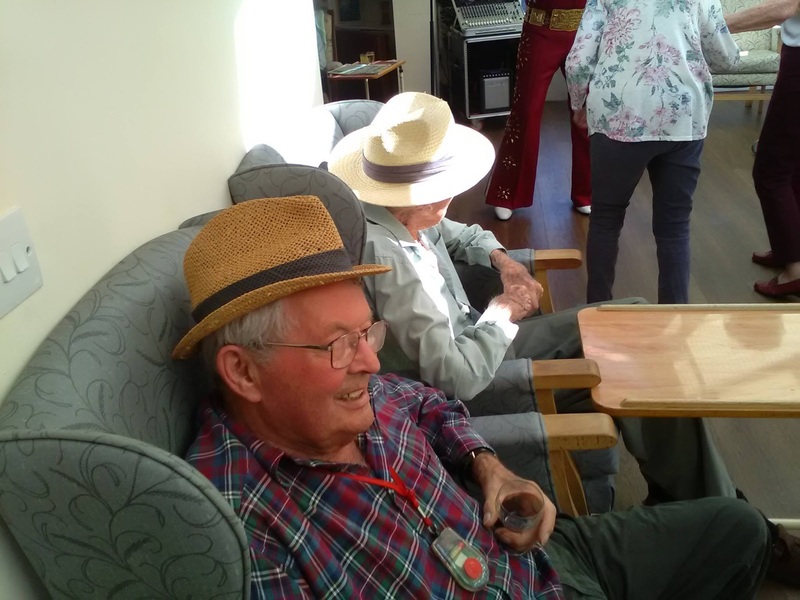 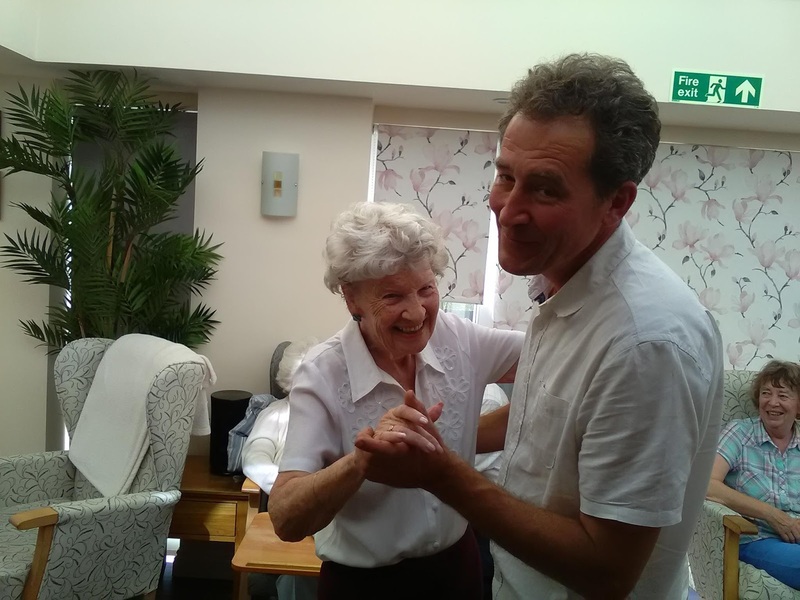 As per usual each week we have activities on at Woodspring House, including movement to music with Heather which encourages everyone to keep fit and active. Then we also have other activities which are in keeping with the seasons. 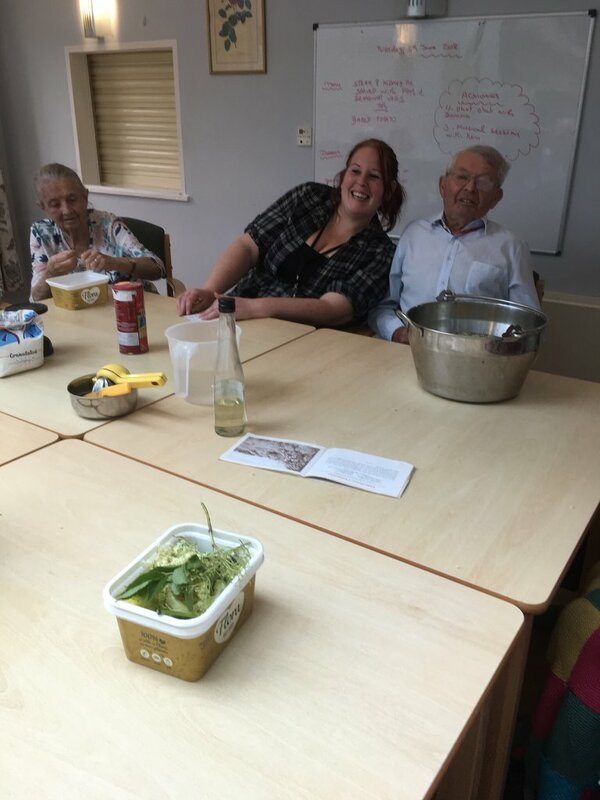 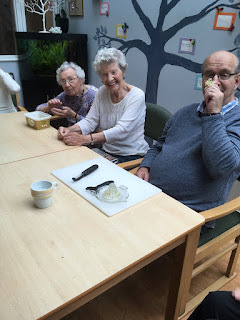 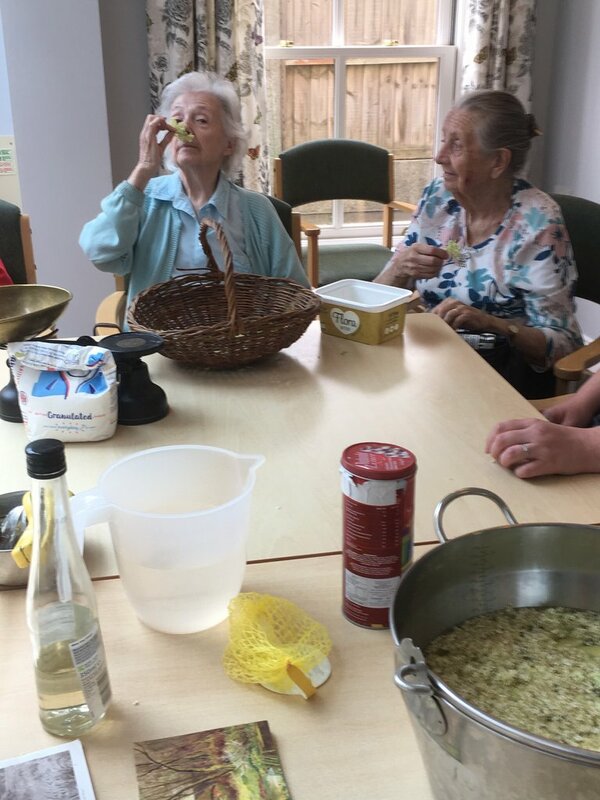 So this week the residents have been hard at work making elderflower cordial and champagne! 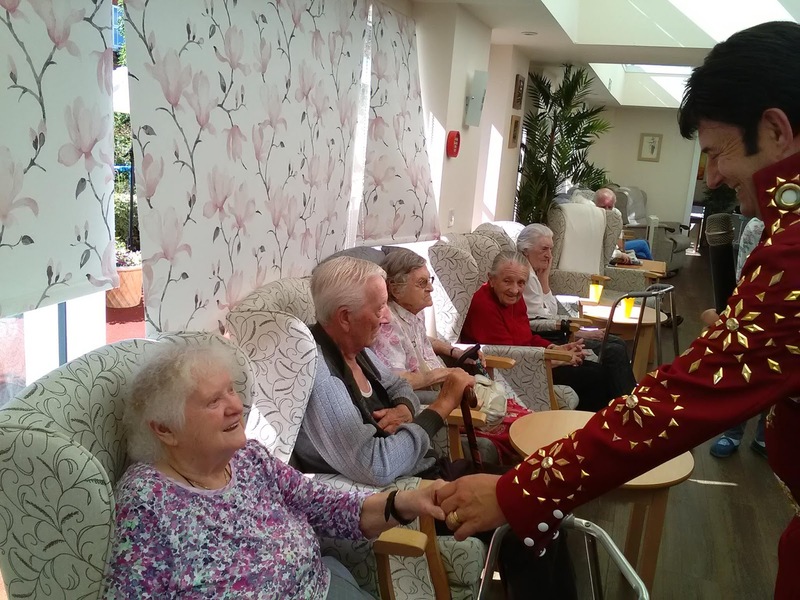 One of the best jobs of the year, and the results are pretty exciting too. 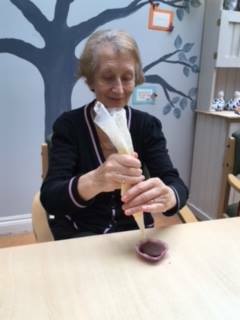 We look forward to (responsibly) trying some in a few weeks time! 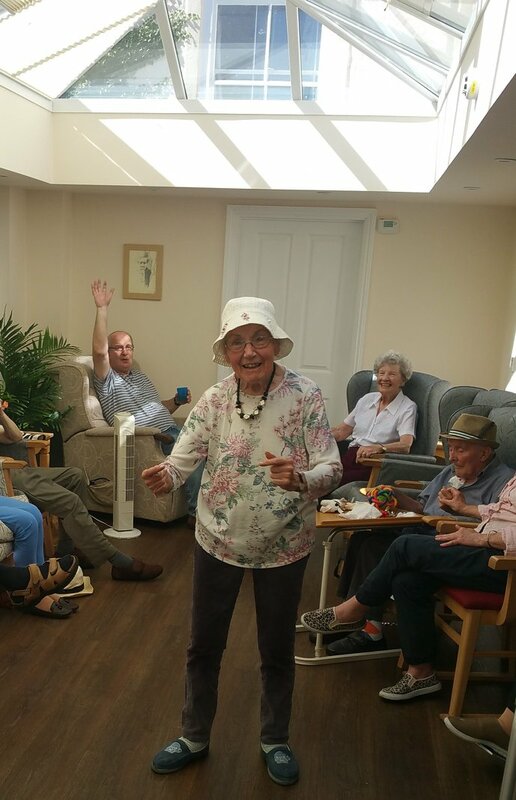 Gwyneth is always in the spirit for having fun! Steve gets in the spirit! A few weeks ago it was Steve and Barbara's birthday so we had Time Scape in to entertain. 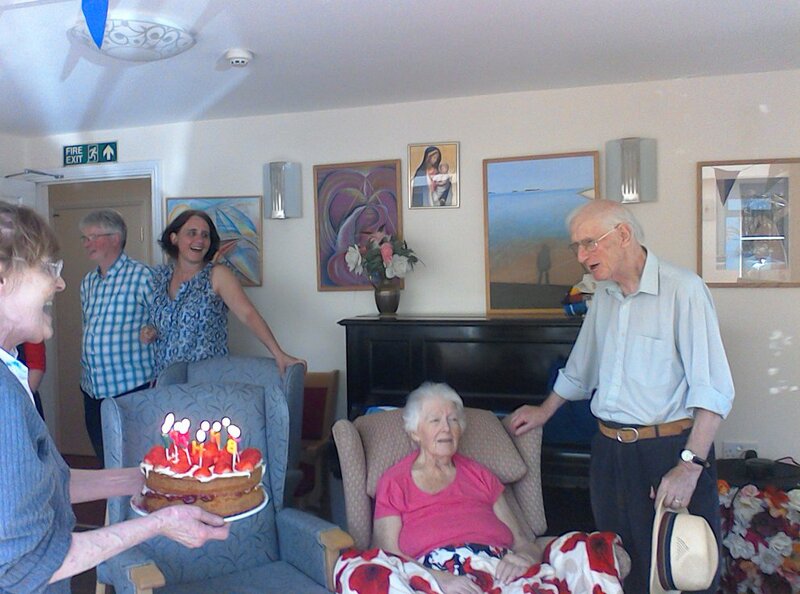 Happy birthday Steve and Barbara!! 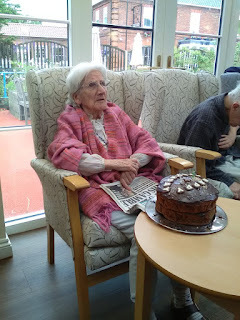 Barbara and her cake! 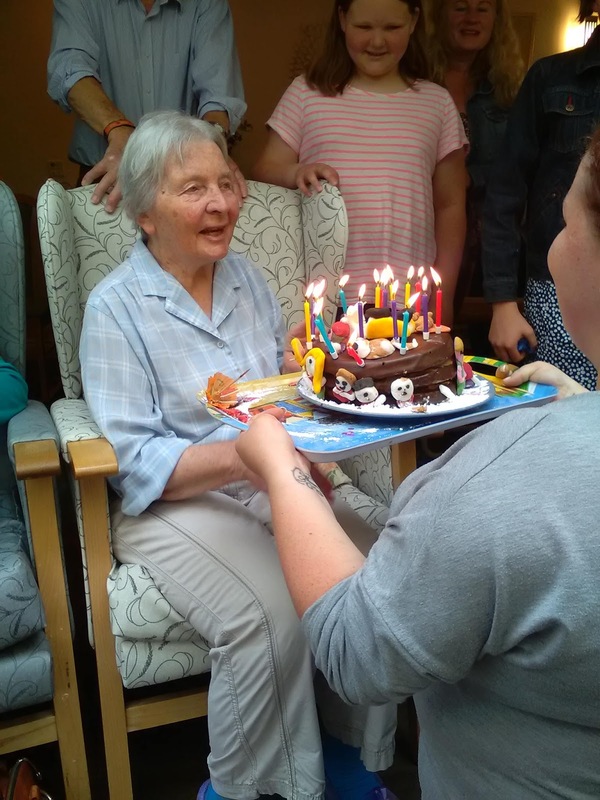 Happy Birthday Barbara! 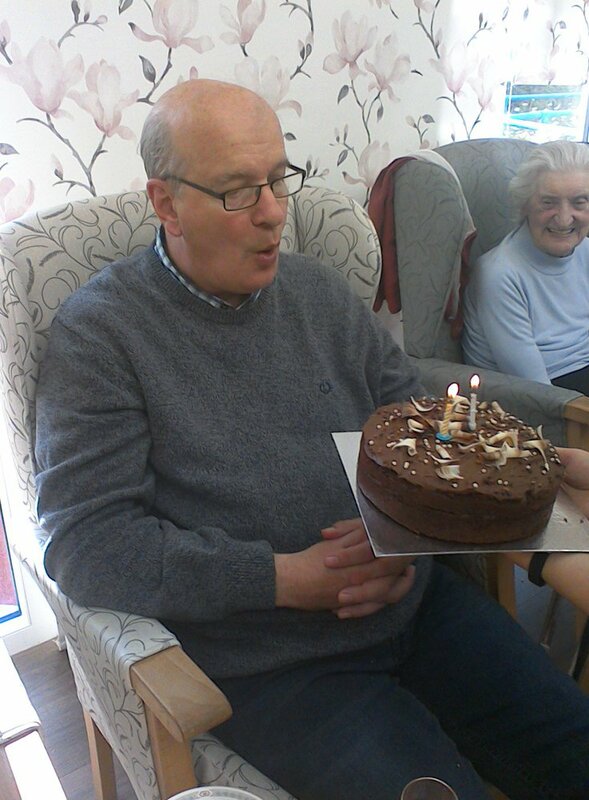 Steve and his birthday cake! 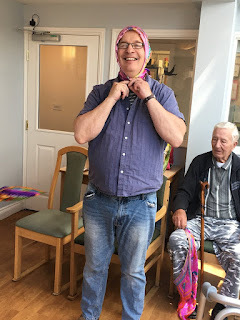 Happy Birthday Steve!